Germany has rolled out world's first hydrogen-powered passenger train. These locomotives named iLint trains and emit zero emissions, making them eco-friendly. This train technology offers greener and quieter alternative to diesel on non-electrified railway lines. 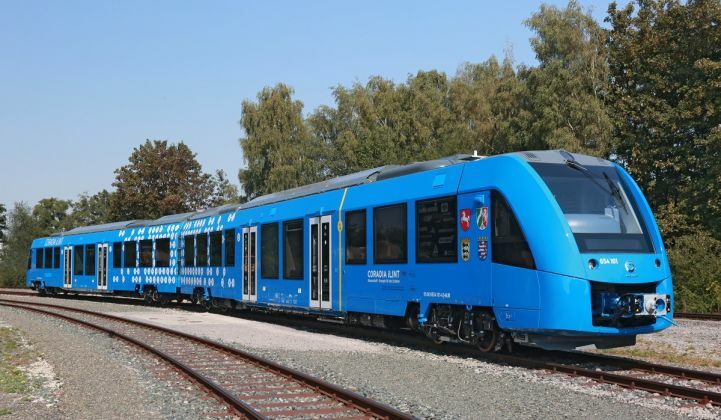 These hydrogen trains are manufactured by French TGV-maker Alstom and are commercially running on 100km route between towns and cities of Cuxhaven, Bremerhaven, Bremervoerde and Buxtehude in northern Germany. Hydrogen trains are equipped with fuel cells that produce electricity by combining hydrogen with oxygen. This conversion process only emits steam and water, thus producing zero emissions. Excess energy produced is stored in lithium-ion batteries on board. These trains also make very little noise. Moreover, hydrogen fuel cells have advantages over batteries. Instead of recharging, they can easily be refueled like gas or diesel engine. It is also easier to build refueling infrastructure for these trains at railway stations. These trains offer attractive prospect to many cities scrambling to combat air pollution. The only disadvantage these hydrogen trains is that they are more expensive than fossil fuel-based trains. Q. Which country has rolled out world's first hydrogen-powered passenger train?